THIS MONTH’S ZINE CLUB MEETING IS AT A SPECIAL LOCATION, NOT AT QUIMBY’S! It’s at Pumping Station: One is at 3519 N. Elston Ave. 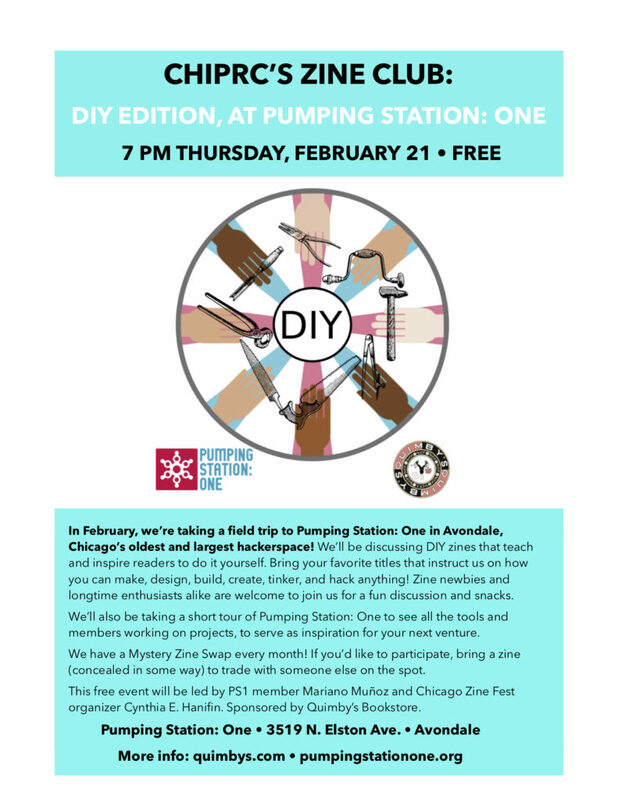 This February, Zine Club takes a field trip to Pumping Station: One in Avondale, Chicago’s oldest and largest hackerspace! We’ll be discussing DIY zines that teach and inspire readers to do it yourself. Bring your favorite titles that instruct us on how you can make, design, build, create, tinker, and hack anything! Zine newbies and longtime enthusiasts alike are welcome to join us for a fun discussion and snacks. We’ll also be taking a short tour of Pumping Station: One to see all the tools and members working on projects, to serve as inspiration for your next venture. We have a Mystery Zine Swap every month! If you’d like to participate, bring a zine (concealed in some way) to trade with someone else on the spot. This free event will be led by PS1 member (and Zine Club regular) Mariano Muñoz and Chicago Zine Fest organizer Cynthia E. Hanifin. Tags: CHIPRC, Cynthia E. Hanifin, diy, hackerspace, maker, Mariano Muñoz, Pumping Station: One, Zine Club, zines.